Since everything has high fructose corn syrup in it we have been making more from scratch, including dinner rolls. I would be lying if I said I didn’t have help; thank you Mr. Bread Machine. 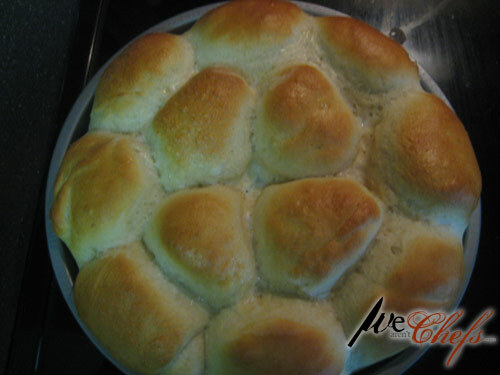 These are pretty quick rolls to make, the most time spent is waiting for it to rise fully. So it’s best to start them about 2.5 to 3 hours ahead of dinner time. Once these are ready to sit to rise, you can make your main course, you have about 40 minutes. Easy, tasty, and high fructose corn syrup-free! Add wet ingredients first then dry adding the yeast on top last. Put on dough cycle. Once done, lay on a floured area and cut into 12 equal pieces. Place the rounds into a round, lightly greased baking pan. Cover the rolls with a damp cloth, and let rise until doubled in volume, about 40 minutes. Meanwhile, preheat oven to 350 degrees. In a small bowl, mix together the egg white and 2 tablespoons water; brush lightly onto the rolls. Bake in the preheated oven for 15 minutes, or until the rolls are golden brown. Remove from pan and let cool on rack for a few minutes. Enjoy!